Nagpur: A con man posed as customer and decamped with electrical goods worth Rs 13,569 from a shop on Pratap Nagar Main Road on Monday, September 17 evening. However, the CCTV installed at the shop has caught the burglar in his act and now cops are hunting him. According to the complainant, Dipen Narhari Trivedi (21), resident of Plot No. 5/B, near Syndicate Bank, Gorepeth, told police that he owned a shop named Trivedi Electricals, near Prasad Medicals, on Pratap Nagar Main Road. On September 17, around 6.25 pm, Dipen went to house for some work and his father Narhari Trivedi (59) was sitting in the shop. An unidentified man came to the shop and handed over to his father a list of goods he wanted to purchase. After packing the electrical goods worth Rs 13,569, the con customer asked Dipen’s father he wanted four wall fans. The moment his father went to godown for bring the fans, the customer decamped with the packed goods. However, the con customer was not aware of the fact that a CCTV camera installed at the shop was capturing his face and the sly act. 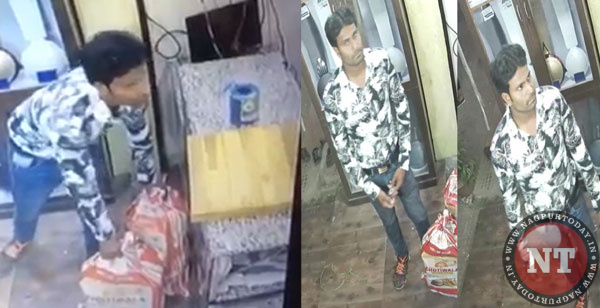 The CCTV footage shows the burglar gauging the situation minutely, keeping watch on movement of Narhari Trivedi and decamping with two bags of electrical goods at an opportune time. Pratap Nagar police, based on Dipen Trivedi’s complaint, has registered a case and hunting the con man.